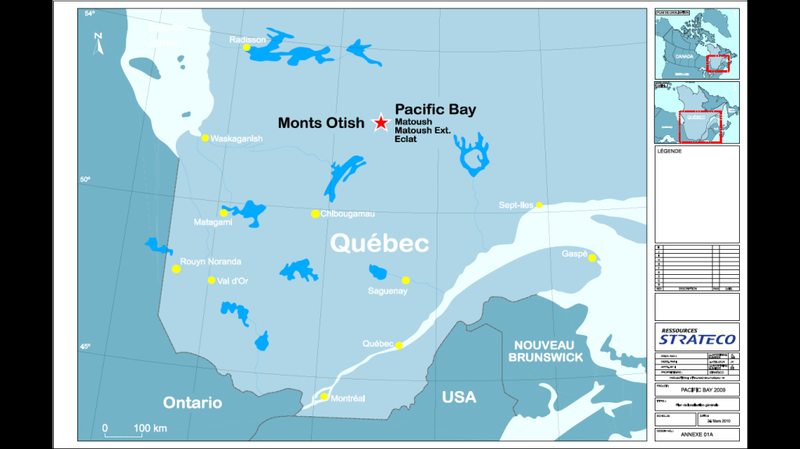 The Otish Mountains Property, comprising an area of 14,576.33 hectares (145.76 km2), is located in northern Quebec and adjoins the Matoush Uranium property owned by Strateco Resources Inc of Montreal. Pacific Bay acquired the property mainly by staking in 2006 because of the highly prospective geology of the Otish region, the rising price of uranium, and the proximity to Strateco’s Matoush high grade uranium deposit. The Matoush Deposit hosts a National Instrument 43-101 compliant indicated resource of 586,000 tonnes with an average grade of 0.95 % U3O8 containing 12.33 million pounds of U3O8 and an inferred mineral resource of 1.69 million tonnes at an average grade of 0.44% U3O8 containing 16.44 million pounds of U3O8. The Property is located approximately 275 kilometres north of the town of Chibougamau and is accessible year round by air, and in winter by the Eastmain winter road, which runs about seven kilometres to the west of the property. Strateco built a 1.3 km landing strip that is used for the transportation of the manpower and equipment required for the project. On January 14, 2008, the Pacific Bay Minerals Ltd. optioned the Otish Mountains Property to Strateco. The option agreement called for Strateco to: (i) to pay to Pacific Bay a total of $500,000; (ii) to issue 200,000 common shares of the Company over 4 years and (iii) to incur $3 million in exploration expenditures over 4 years, including a minimum of 10,000 metres of drilling. As part of the transaction, the Strateco acquired one (1) million units of Pacific Bay at a price of $0.30 per unit. In 2012 Strateco completed all its obligations under the option agreement and a joint venture was formed whereby Pacific Bay and Strateco participate on a 40/60 pro-rata basis. Pacific Bay’s JV partner has for several years been seeking Provincial and Federal approval to conduct underground exploration work on its Matoush Uranium Deposit. Notwithstanding the approval of the Canadian Nuclear Safety Commission granted in 2012, the Province of Quebec has not render a decision on the project as of the date of writing. In the first quarter of 2013, the Province of Quebec declared an effective moratorium on uranium exploration and development in the Province pending further study. The moratorium has prevented Pacific Bay and its JV partner Strateco from exploring the Property. In mid-2014, Quebec commenced a Province-wide community consultation process to seek public input regarding the social and environmental acceptability of uranium mining in Quebec. This process is expected to continue throughout 2014. Pacific Bay strongly believes that uranium mining is safe and environmentally sound when carried out responsibly. Pacific Bay believes Strateco is a responsible and professional firm that has complied with all regulations conducted wide consultation in the local communities. Seven holes totaling 1,510 metres were drilled on the Otish Mountains Property in 2008. The holes were drilled between August 8 and September 7, 2008 using a helicopter-transportable drill (Versa drill). The holes were drilled in the “Rabbit Ears South” sector. The targets were established for the purpose of identifying a Matoush-type uranium mineralized zone, based on the results of prospecting done in 2007 and 2008, geophysical surveys and the geomorphology study done by Poly-Géo Inc. in 2008. Following the completion of drilling on the Mistassini property in late June 2009, the Company took advantage of the availability of the helicopter-borne drill to drill a 200-metre hole on a section of the Otish Mountains Property, which consists of four mining claims in the possible extension of the Matoush fault, 3 km south of the Eclat property. The Matoush fault was not intersected. In the third quarter of 2009, seven holes were drilled on the Otish Mountains Property. Four holes were drilled to trace the Matoush fault, which becomes diffuse north of the Eclat Nord property. No remarkable structures were identified. Three holes were drilled to test a linear geophysical anomaly on the “Rabbit Ears” area, about 5 km east of the AM-15 lens, but failed to locate any structures of note. Work ended on the property in September 2009. In 2010, on the Otish Mountains Property, prospecting work was done in the second quarter on the north-south belt to the west of the Eclat South area. This led to the discovery of a 3.0 metre anomalous sub-outcropping boulder measuring up to 1,800 counts per second approximately four kilometres west of the Matoush fault. The three holes totaling 2,010 metres drilled early in the fourth quarter of 2010 to test this structure were highly successful. A Matoush-type fault called the Alfred fault, with identical alterations to those of the Matoush fault, was intersected over 365 metres. The geophysical anomaly indicates that the Alfred fault extends to the north and south. This is an important discoverie on the Matoush project outside the Matoush fault corridor. These holes, which returned weak uranium grades, show that other Matoush-type structures (faults) exist throughout the Matoush project. Five holes totaling 2,931 metres were drilled in the first quarter of 2011 on the Pacific Bay-Matoush property, where Strateco exercised its right to earn a 60% interest. Starteco acquired its 60% undivided interest on October 29, 2011. In 2011, 10 holes totaling 5,511 metres were drilled on the Pacific Bay-Matoush property. No exploration work on the Property in the last few years due to market volatility and the above noted moratorium.